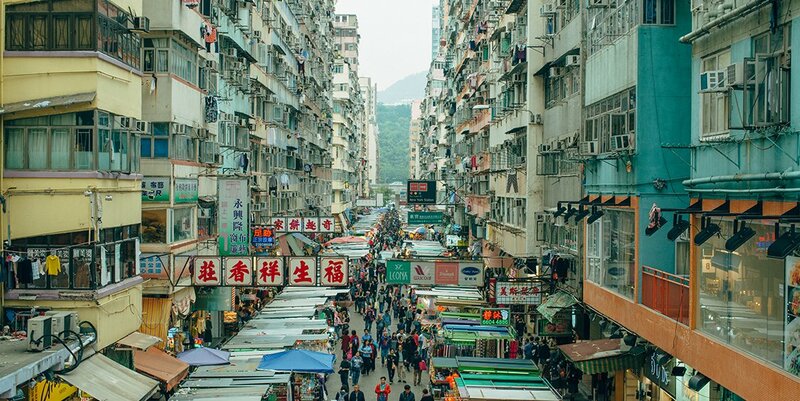 Loud, crowded and sometimes chaotic, neon-drenched Yau Tsim Mong (named for its three main neighbourhoods, Yau Ma Tei, Tsim Sha Tsui and Mong Kok) encapsulates the extremes of Hong Kong. With high-end label Mables mere metres away from stalls selling all manner of kitsch and kaboodle, you can shop for high, low and everything in between. Christopher deWolf introduces the district's markets. Inside the green stall is a collection of prints by local illustrator Little Thunder; this is the opening party for her latest exhibition. It’s not exactly what you would expect from a market stall, but Hong Kong’s street markets defy expectations. You’ll find tourist trinkets, surplus designer clothing, fresh flowers, a bewildering array of foodstuffs – and maybe even some neighbourly conversation. Start in the Yuen Po Street Bird Garden whose tile-roofed Chinese-style buildings opened in 1997 to house bird hawkers displaced when their former home, nicknamed Bird Street, was redeveloped. Here you can buy bird seed, grasshoppers or a new gilded cage for your pet – or you can simply admire the songbirds and parrots. That’s especially true at night. As the sun slips below the horizon, make your way to Temple Street, home to Hong Kong’s longest-running night market. Grab a stool and order some clay pot rice at one of the restaurants near Public Square Street, or feast on spicy crab at one of the restaurants around Saigon Street. Along the way, you’ll discover stalls selling every kind of knick-knack imaginable. The sound of old-school Chinese pop songs drifts out onto the street from one of the many time-warp karaoke bars. Originally produced by LUXE for DiscoverHK.